Measuring radon levels in a home is key to protecting the health of anyone breathing the air. 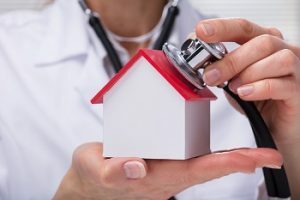 The fact that radon causes cancer should be the reason to find out if you, or your family, is being exposed to excessive levels of the dangerous gas. It is difficult for people to accept that their home, a place that one looks to for security, is hiding this invisible danger. Radon is a colorless, odorless radioactive gas that has been found in homes all over the United States. It comes from the natural breakdown of uranium in soil, rock, and water that gets into the air you breathe. You cannot see, smell, or taste radon, but it is still a problem in your home. If you breathe too much of it, it can cause a lot of physical problems such as lung cancer, especially in young children who may experience all sorts of physical and developmental issues. In fact, the Surgeon General of the United States has warned that radon is the second leading cause of lung cancer in the United States today. How Does Radon Get Inside My Home? Radon typically moves up through the ground into the air either above or in your home through cracks and holes in the foundation. It can also enter your home through well water. Any home can have a radon problem: new and old homes and homes with or without basements. While radon buildup can occur in any building, it is particularly dangerous in homes where families spend most of their time. The best radon level measurement would be zero, but unfortunately, that’s impossible. Outdoor radon levels in the United States range from 0.02-0.75 pCi/L (picocuries per liter), averaging 0.4 pCi/L. The average radon level in US homes is 1.25 pCi/L, three times higher than the average level outdoors. 1 out of 15 homes in the United States is estimated to have an elevated radon level above the EPA’s 4 pCi/L “action” limit, making your home more radioactive than 94% of US homes. You should always try to reduce radon to a practical minimum. Once a home inspector has found signs of radon in your home, don’t panic. Radon is everywhere and fixing a radon problem is very straight-forward. If you have only performed a single test, the EPA recommends a follow-up test before fixing your home. Radon levels fluctuate naturally, and it’s important to know the initial test was an accurate assessment. After your follow up test and the radon levels need to be reduced, you should hire a professional, qualified radon mitigation contractor to lower the levels in your home to a safer range. Here at the Homeinex Corporation, we have been providing prompt and in-depth inspection in Massachusetts, Connecticut, Maine, Rhode Island, and New Hampshire for over twenty-five years. If you have questions about home inspections testing for radon, contact us today. We can provide next day service on most home inspections.